A few weeks ago, I attended my first BlogPaws--a conference for pet bloggers. Because of the subject matter, the event was pet friendly in ways I couldn’t have imagined: passed doggy appetizers, a pop-up dog park, cats in strollers, capybaras splashing in the sprinklers. I would have loved to bring just one of my dogs and cats, but a trip from New Jersey to Las Vegas–whether by car or plane–would put too much stress on my pets, so they had to stay home. I still wanted to feel like they were there, so I did the next best thing. 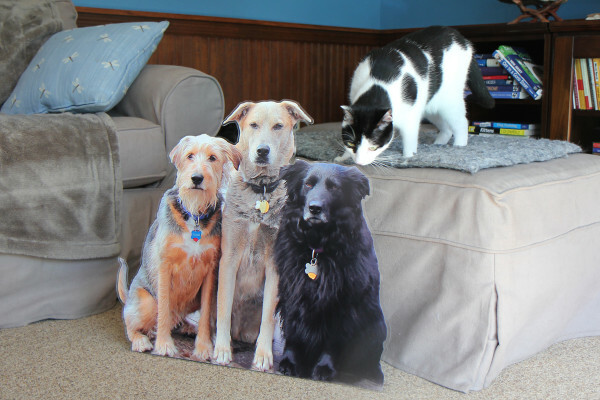 For the cats, I bought a stand-in stuffie I named Rover–because he can travel in ways my feline friends cannot. 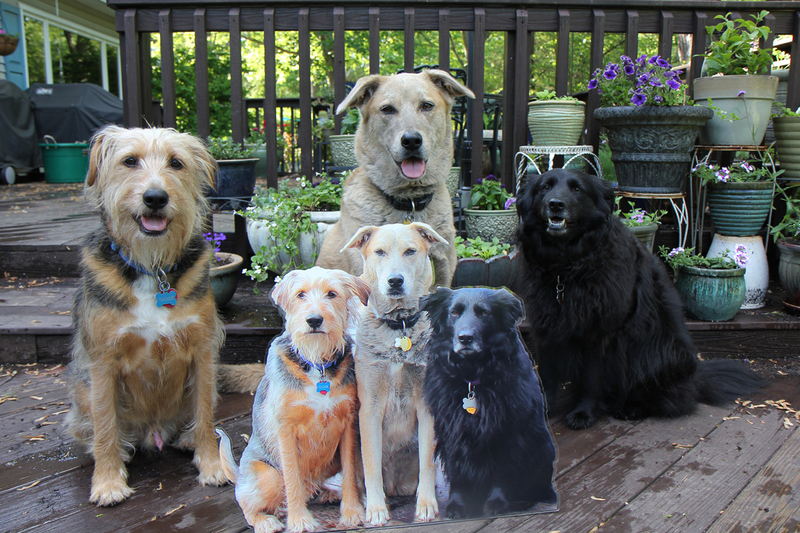 For the dogs, I wanted a flat pet: a portable, thin version of my pups. At first I thought I could make one myself. I’m a photographer, I thought. 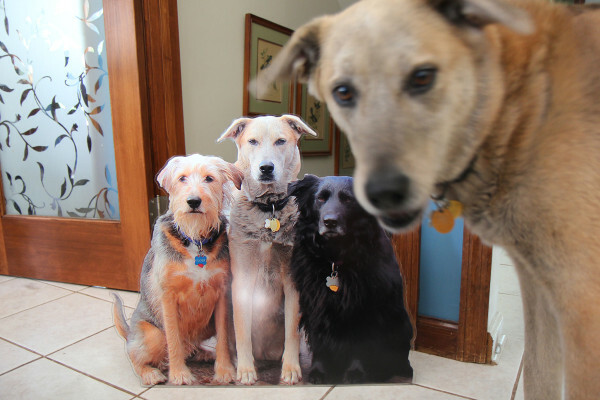 I can take a picture of the three dogs. Surely it wouldn’t be too difficult to find a place that would print it, mount it on foam core, cut it out, create a stand and then package it up for shipping to Nevada. So, instead I hired Christy from Pancake Pets to make one for me. All I had to do was provide the photo. She did all the rest. Best part (other than the fact that she made it easy, sending me emails and pictures for confirmation, and had it hand delivered to my room at the hotel) was the final product was made of acrylic, not foam core, so I could take it anywhere, and not worry about it getting scuffed or scratched. I had my flat pets shipped home so I wouldn’t have to take them on the plane. 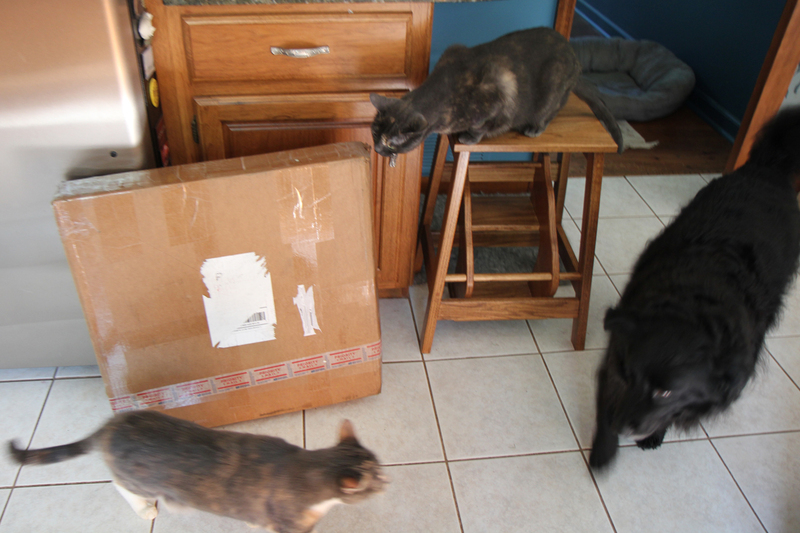 They arrived a week or so ago, and I’ve been waiting for a the right time to introduce real Lilah, Jasper and Tucker to their flat doppelgangers. I thought it might be fun to see the cats’ reactions as well. What follows is that story, in pictures. A mysterious box appeared in the kitchen. Dawn scurried by. Lilah made a detour around it. Athena had to investigate. 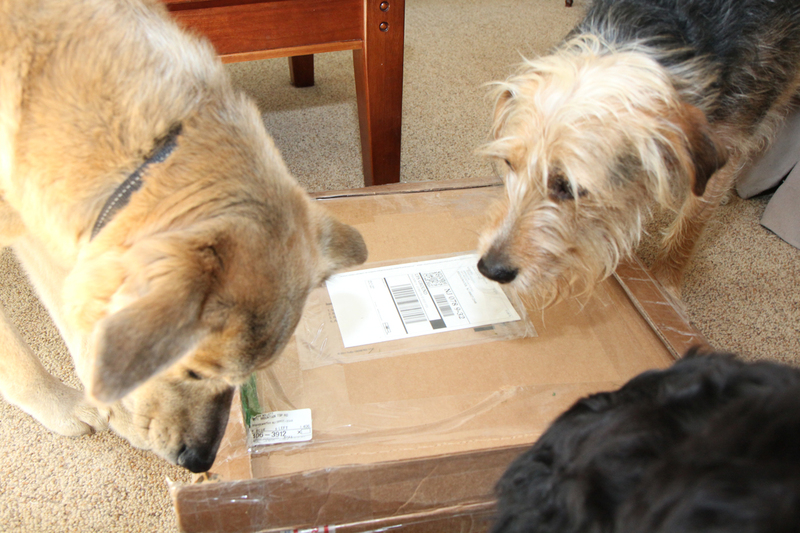 The flat pets arrive in a mysterious box. I brought the box into the family room to open. Everyone helped, of course. And by helped, I mean, everyone got in the way. I pulled the flat pets out of the box and set them up where interested parties could sniff them. Who are these silent creatures? This box included bubble wrap, which required special attention. Bubble wrap, crinkle paper and a box! My favorite things! 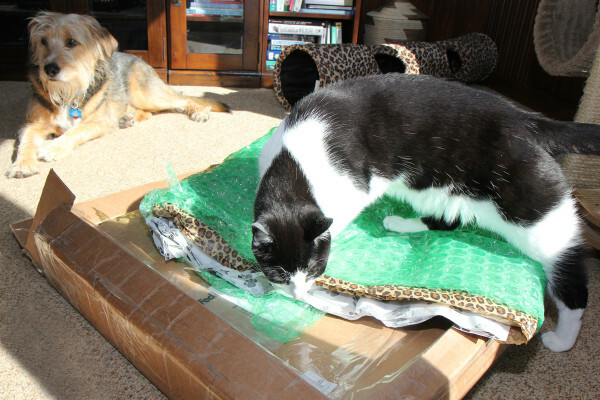 While Calvin was distracted by the triple-play excitement of box, bubble wrap and tissue paper, Elsa Clair moved in for a sniff. 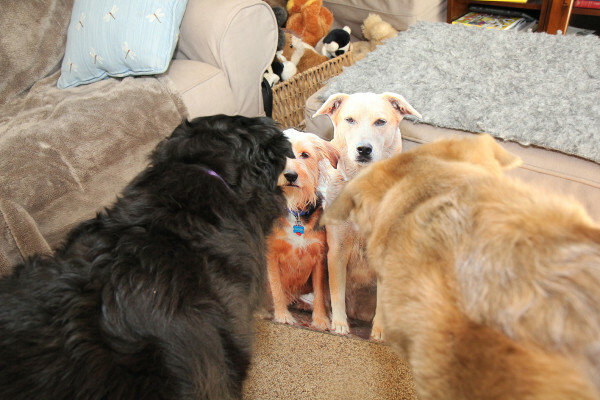 Elsa Clair inspects the flat pets. Noticing that his sister found something interesting that he should have found first, Calvin tore himself away from the box and headed over to see the flat pets for himself. I’m bigger than the dogs! 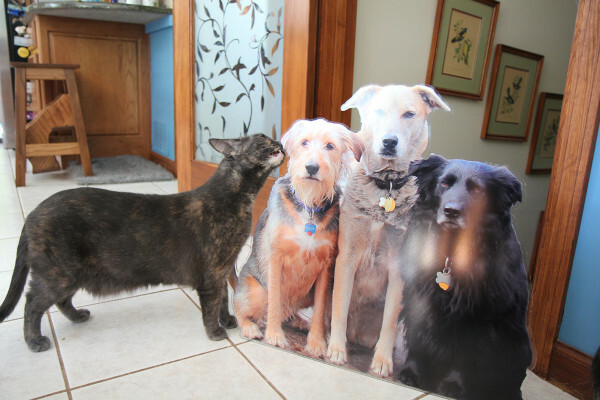 Though the dogs held back at first, they couldn’t help but be curious, since the cats seemed to think this strange staring object was worthy of attention. They might look like dogs, but they don’t smell like dogs. By now, I figured everyone was friends with the silent trio, and decided it would be fun to try and get a picture of the Reals with the Flats. Jasper and Tucker seemed okay, but Lilah still didn’t like them. Notice the one ear back in the picture below. She’s sitting there because I asked her to, but she’s not happy about it. I didn’t like how the light from the window reflected off the shininess of the acrylic, so I thought I’d try to pose them elsewhere. I also wanted to work with Lilah a bit to increase her comfort level. 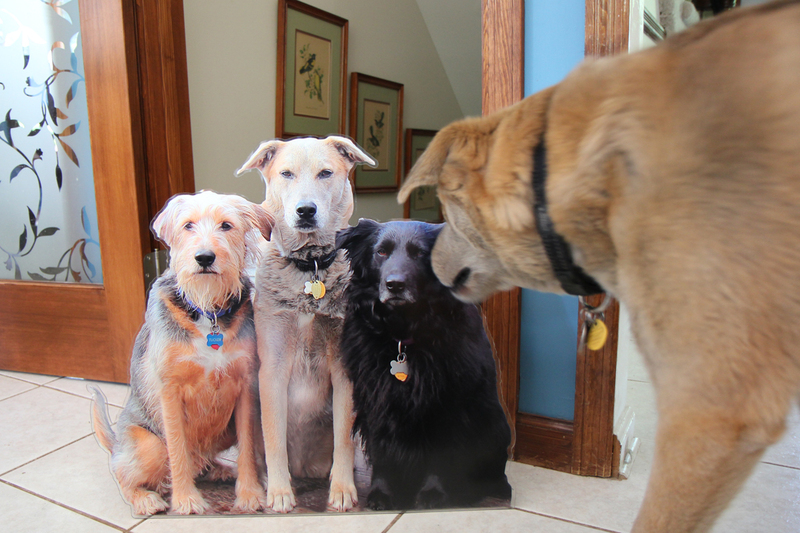 In the meantime, I set Flat Tucker/Jasper/Lilah in the kitchen so I could focus on real Lilah. They don’t smell any better over here. …and Athena came in for a sniff and a rub. She emailed her request for a trade-in later that day. Apparently, flat pets are an improvement over the real slobbery, smelly, noisy ones. Jasper stopped by again, hoping the three new dogs would play with him–or at least offer a friendly sniff and a wag. But they rebuffed his advances, confusing his doggy brain. 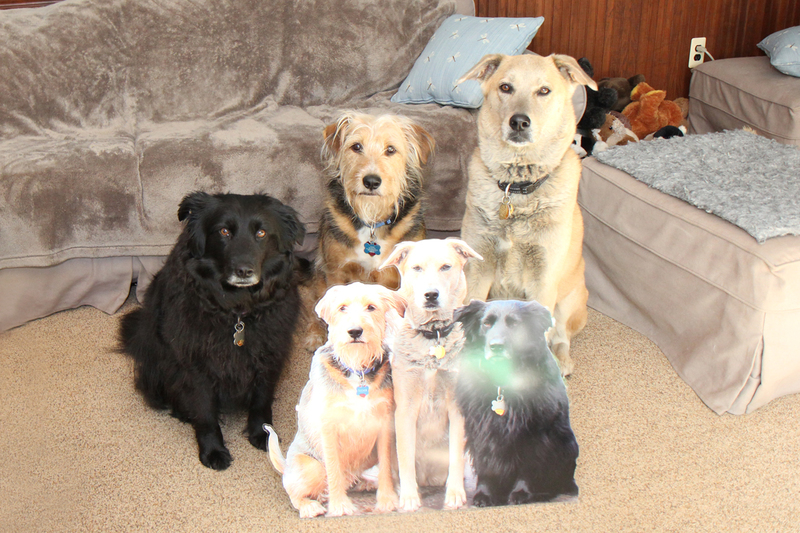 I thought our dining room might offer better lighting, so I brought the dogs in there and had them sit, hoping to recreate the order that was in the original photo for the flat pet. At this point, I realized I was pushing it. Tucker was distracted, Jasper wanted to play, and Lilah was still nervous. That was my cue to leave it be, and take the dogs outside for some runs and funs. Later, after everyone settled down, and Lilah had a few more comforting nose touches, I tried one more time to see if I could get the picture I was looking for. I think I came pretty close; don’t you? I received no compensation for writing about my flat pets; I paid for them just like anyone else. I appreciate a great product, and what I consider a work of art, and am happy to write about it and feature it. Also, I received many compliments on Flat Tucker/Jasper/Lilah and dozens of people asked where I got them from. Christy was so pleased, she told me that anyone who ordered their own Pancake Pet could use the code LWDAC and would receive a special deal. Today I’m participating in the Monday Mischief blog hop. 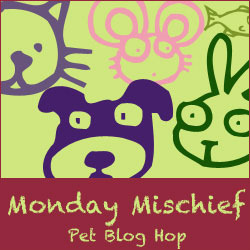 Stop by some of the awesome blogs below to see what mischief other pets are getting into. 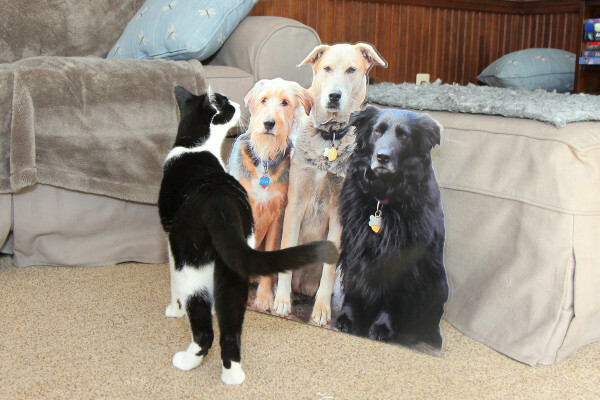 29 Comments on "Story: Real pets meet flat pets"
I love your Pancake Pet pack! Thank you! I can’t take credit for the idea or the implementation. Just the photo. But I loved bringing my flat pets with me, and I will surely be bringing them to any future conferences as well. Too funny. Lilah is like my Maggie…I”ll sit here because I know you will give me a treat, but I won’t cooperate any further than that. great assortment of flat and 3-D photos. Aw thanks. I thought about making flat cats too, but I couldn’t get a picture of all four together like to did with the pups. Instead, I brought Rover, my stuffie stand-in. I wrote a post where I introduced him to the kitty gang to make sure they approved. Thank you! The conference was awesome, and I’m already looking forward to next year’s in Nashville. You had one of the best flat pets we’ve seen. Christy did a great job. Thank you. I agree; Christy creates wonderful flat pets. … and it was SO fun to see you all up on stage accepting your pawsome award! Thanks. They kept me sane up there. I think the Flats and my stand-in stuffie Rover did a good job representing my Reals. Thank you. She used to be so skittish as a pup, and we worked with her to reduce her anxiety near new things. Usually she’s ok, but every once in a while I have to play the Touch it With Your Nose game, and that always helps. LOL the flat ones. Glad you had a great time at Blogpaws. 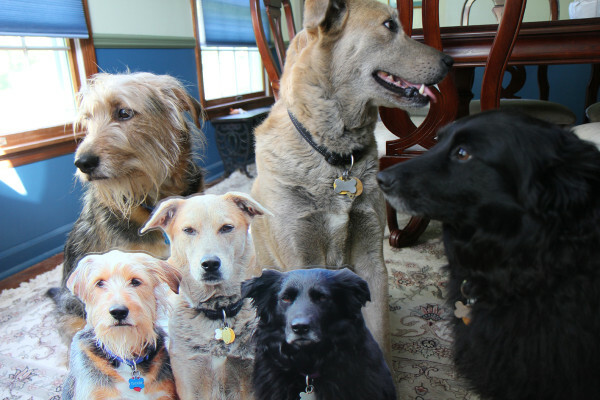 Emma over at Mygbgvlife has nominated you for our guest blog Share It Sunday. You don’t have to do anything. Just email us a link to the blog you’d like us to showcase and we will do the rest. Also if you can send us a link to the blog you’d like to nominate for the Sunday after that would be great. We are at mollyDOTthewallyATbtinternetDOTcom. Have a terrific Tuesday. What a great idea! I had wondered how you made them because although I plan to attend Blog Paws next year, I have not decided about the dogs yet. If I’m not able to take them, you can be sure I will use Pancake Pets to make their flat images. As much as I wish my dogs and cats were with me, the Flats and my stand-in stuffie Rover were fun. And they don’t take as much care and feeding as my Reals. So cute! I will definitely use Pancake Pets if I ever need my gang to be flat! 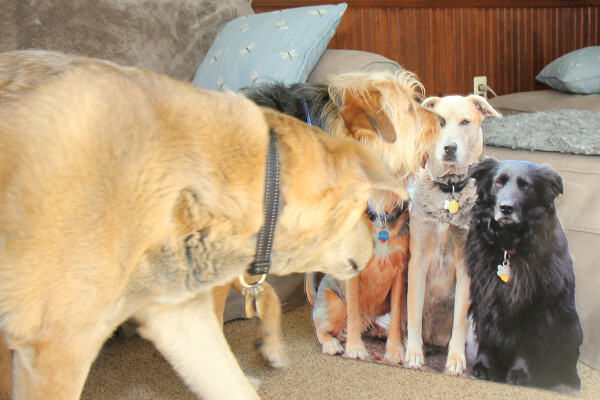 Yours really looks great, and that last picture of the pups with their flat versions is so cute. 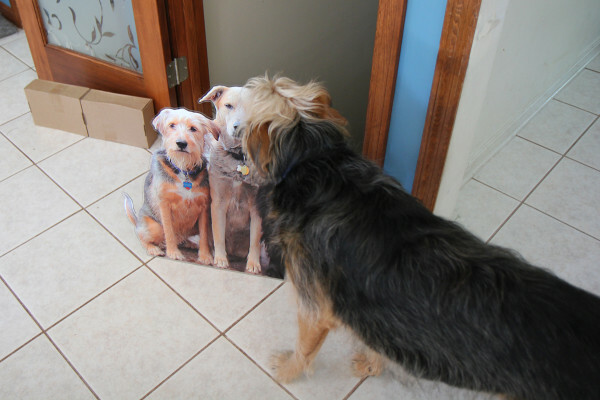 Those flat versions of you sure caused quite a stir when they got back from their adventure! And of course not forgetting the box and packaging! Thanks Snoopy! For some of us, the box was the best part! Funny story! Congrats on the Nose-to-Nose award, too! And where do you think I can read this Cat Pawbook because I want to know more about normal cat activities and Whiskers won’t tell me. And is it weird that I can imagine every post on this blog as an animated cartoon series? Thank you! To answer your questions, the Cat Pawbook is only available to certified cats and is handed (pawed) out at secret kitty initiation meetings. I was lucky enough to get a peek at one, but few humans have that opportunity. And you go ahead and imagine my blog as an animated cartoon series. It’s meant to amuse–and if anyone out there wants to turn it into a series, I’m open for discussions. This is so funny! Lilah is beautiful, and Tucker looks so much like my childhood dog, Poppy, an Airedale/cattle dog mix.